Get the Full StoryThe Insider Picks team writes about stuff we think you'll like. Business Insider has affiliate partnerships, so we get a share of the revenue from your purchase. One of the Platinum Card from American Express's best perks is access to airport lounges all around the world. Lounges are a great place to enjoy drinks, snacks, and Wi-Fi while waiting for your flight, all separate from the main part of the terminal. Here are the three types of lounges you can access with the card, and the best ones. While the Platinum card from American Express comes with a lot of different benefits, one of the most enjoyable is access to more than 1,000 airport lounges around the world. In these comfortable, exclusive spaces, you can enjoy things like free drinks from wine, beer, and spirits to coffee and soda , snacks or heartier food, fast Wi-Fi, comfortable seats, and sometimes amenities like showers or spa treatments. Even during busy travel periods when the lounges are more crowded, they make peaceful respites from the main terminal's frenetic pace. Whether you're having a few drinks with friends before heading off on an adventure together, or you're having a cup of coffee and answering a few e-mails before on the way to an out-of-town meeting, lounge access is an extremely valuable perk of the Platinum card especially if you add up the value of all those free drinks and snacks. In general, lounges are operated by any of a few different parties. Some are run by airlines, either for lounge members or just premium passengers. Others are opened and managed by third-party companies, which tend to sell day passes, and often grant access to premium-cabin passengers with contracting airlines or members of certain participating clubs or networks. Still others are run by airports or terminal management companies themselves. There are a three groups of lounges that you can access with the Platinum card. Read on to see what they are, as well as some of the best in each category. Arguably the best lounges that you can access while flying domestically in the US, Centurion Lounges are some of the most luxurious and pleasant spaces to relax before or even after your flight. These chic, thoughtfully designed spaces offer a wide range of amenities including complimentary cocktails and food created by award-winning mixologists and chefs, respectively, fast Wi-Fi, comfortable seating, tons of newspapers and magazines, tea and coffee, and private work areas to hold meetings or take calls. Some locations also feature shower suites and or areas. There are Centurion Lounges at eight airports around the US plus one in Hong Kong with the tenth location set to open in 2019 at JFK. You can bring up to two guests or immediate family members in with you. If you're traveling with a big group and you're the only cardholder, you can purchase access for additional guests. There's no one Centurion Lounge that is generally considered the "best," although the locations in Hong Kong and Philadelphia are the newest. San Francisco's is considered to be excellent pictured above , and the lounge in Las Vegas has a great atmosphere, too. The location in Seattle was recently renovated, and the Dallas-Fort Worth lounge is undergoing an expansion now. Even during the busy travel period before Thanksgiving, I found the La Guardia location to have plenty of seating and room. American Express has a deep-running partnership with Delta Airlines, and one perk is that Platinum cardholders get access to Delta's Sky Club lounges whenever flying with the airline. With more than 30 locations, Sky Club lounges offer snacks, complimentary soft and alcoholic drinks, fast Wi-Fi, and spacious, comfortable seats so that you can relax before your flight. Some of the larger locations feature showers, too. Depending on the airport, these lounges can vary in size by a lot for example, the Tampa, Florida Sky Club is a lot smaller than the flagship locations in Delta's Atlanta hub though they're generally all comfortable. My personal favorite Sky Club is in Terminal 4 of New York's JFK airport. Not only is it spacious without feeling cavernous, but it features a great food and drink selection, clean and well-stocked shower suites, and work areas where you can set up and be productive. The best feature, though, is the "Sky Deck," a large outdoor porch with loungers and tables where you can enjoy a drink or use the Wi-Fi in the fresh air while watching planes take off and land. There's something so relaxing about being able to go outside, even when you're post-security in the terminal. The Sky Club in Atlanta at Concourse F also features an outdoor Sky Deck pictured above . Access is complimentary for cardholders when flying with Delta, and guest passes are available for a discount. Delta Sky Clubs and the Centurion Lounge tend to be more useful when flying within the US although both have expanded internationally , but you can still access lounges all around the world through Priority Pass, a network of more than 1,000 participating lounges at airports around the world. The network includes some airline's lounges like the Korean Air business class lounge at JFK , as well as spaces operated by third-party companies and airports. Amex Platinum cardholders can enjoy an included Priority Pass Select membership, which grants access to you and up to two guests at a time as long as there's room occasionally, Priority Pass lounges can get crowded . If you have an international version of the card, instead of the US version, be sure to double check the guest policy for your card's Priority Pass benefit. Amenities vary by lounge, but typically feature free snacks, drinks, newspapers and magazines, showers, and more, all separate from the hustle and bustle of the main terminal. Recently, Priority Pass has even started adding airport restaurants to the network. At these restaurants including the Grain Store at London's Gatwick airport you'll get a certain amount credited on the bill for you and each guest. At the Grain Store, each guest is entitled to a 15 credit. 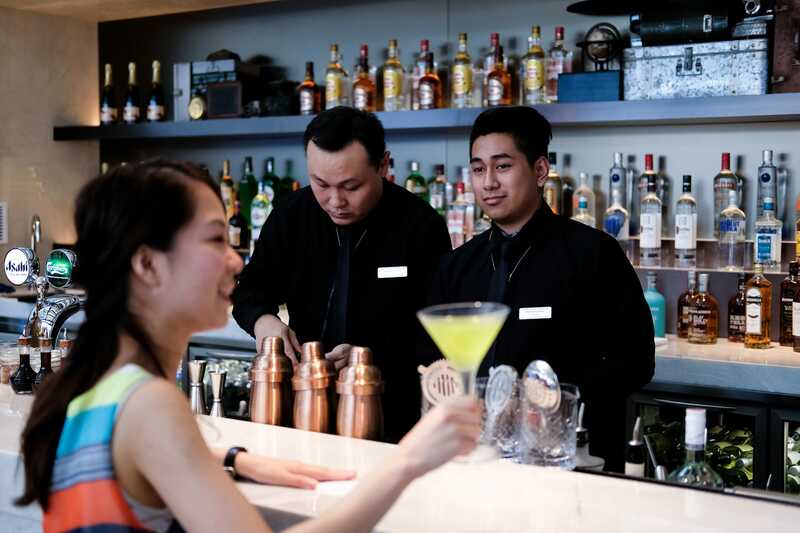 While it's hard to pick out the best from a pool of over 1,000, a few that stand out among frequent flyers are the Air China Lounge in Beijing, the Aspire Lounge at Zurich, and the Plaza Premium Lounges in Hong Kong and London Heathrow. I'm also partial to the No. 1 Lounge at London Gatwick, which you can fly out of on Norwegian Air Shuttle for great prices.